To commemorate the 1906 San Francisco Earthquake, Ballet Mori engaged the Earth as a living medium and a conductor for dance. In this improvisational performance, SF Ballet Principal Dancer Muriel Maffre responded to a musical composition modulated live by the unpredictable fluctuations of the Earth's movement as measured in real time by a UC Berkeley seismometer at the Hayward Fault. We are grateful for support from Randi and Bob Fisher, Doug and Barbara Engmann, and Dugan Moore, and additional support from: John and Jola Anderson, Nion MacEvoy, Steven and Niko Mayer, Dr. Jerome Oremland, Steven and Diana Strandberg, Voltage Security, Inc. Joe and Carole Neil, John Pierce, Andrew and Francoise Skurman, Dr. Roy and Helga Curry, Jim and Eilyne Killoran, Daniel and Lois Shapiro. Mori live web display and sound samples. San Francisco Ballet to Use Seismic Sounds. Associated Press, 30 March 2006. (picked up by over 40 publications worldwide). NPR Radio Interview by Phyllis Owens, NPR Weekend America, 15 April 2006. 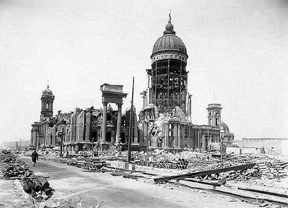 1906 Earthquake Centennial Inspires Ballet Performed to Live Seismic Data. by Yasmin Anwar, UC Berkeley, 30 March 2006. Shaking up the Ballet. by Jonathon Keats, Wired Magazine, April 2006. Ballet Mori Review. Allan Ulrich, Voice of Dance, April 5, 2006. Ballet Mori Review. Anna Orrghen. Rhizome, 18 April 2006. Ballet Conducted by the Earth. David Pescovitz, Boing Boing, 18 April 2006. Radio Interview by Sarah Varney. NPR California Report (KQED Radio Bay Area). 4 April, 2006. Ballet Mori Review. Rachel Howard, San Francisco Chronicle, April 6, 2006. Ballet Mori Fundraiser Leah Garchik, San Francisco Chronicle, March 15, 2006.